As such, cleaning house is a lowwww priority, with the exception of the kitchen. So setting up the punchline, I needed to have some kind of tea party conversation. Initially I had the tea be “Tea of Pee” because you know, kids! But, that didn’t have the punch I was hoping for. Now, in the back of my mind I knew there’s a coffee made of muskrat dung or was it some other animal? A quick google search says it’s a “civet”. My sister bought me some from Southeast Asia and although expensive, it didn’t taste half bad!! 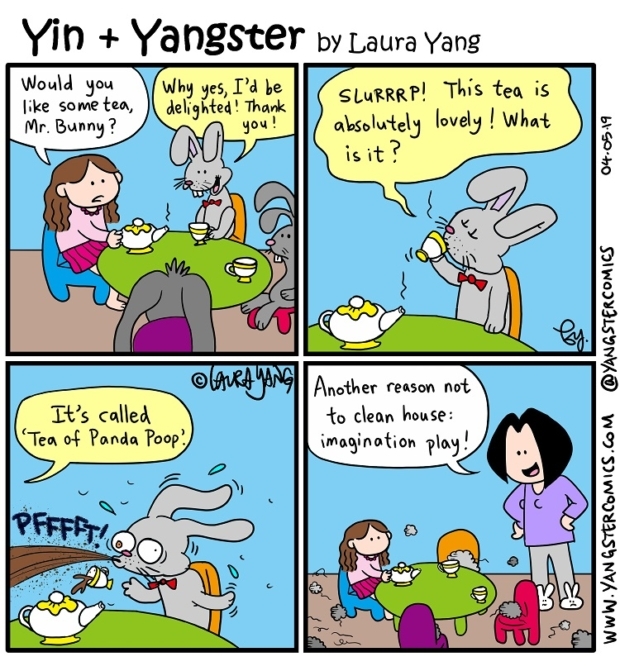 Since this was a tea party, I googled up tea from animal poop and behold, Panda Poo Tea!!!! Perrrrfect! !